As expected, the rest of the Android 4.2.2 (JDQ39) files for Nexus devices are starting to become available. 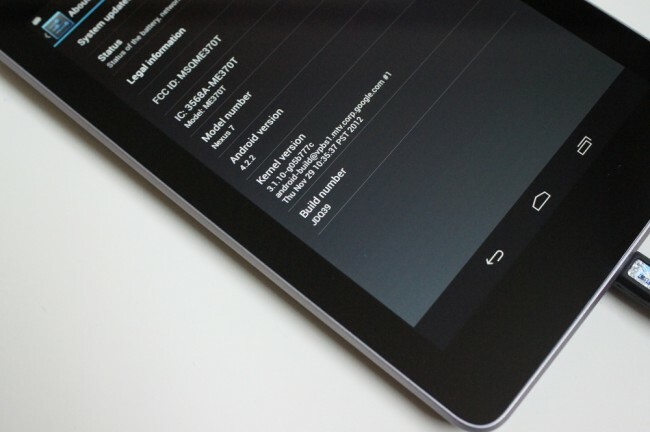 Here is the link for the Nexus 7 “nakasi,” which is the WiFi-only version. In order to update using this file, you’ll need to come from JOP40D. 1. Download the file from above to your internal storage. 2. Temporarily flash a custom recovery if you haven’t already. 5. Choose the new JDQ39 update file and install. *If you want the full detailed instructions, hit up this guide. 2. Make sure adb is working correctly by typing in “adb devices” into a command prompt. *You should get a serial number in return if your device is detected. 3. In the same command prompt, type in “adb reboot bootloader” to reboot to fastboot. 4. From the bootloader screen, scroll down to “Recovery” and select it. 5. If you see an Android with an exclamation mark, press Volume Up and Power to move past to recovery. *You could also rename the .zip file to something easier to type like “JDQ39.zip” as well. 8. If it works correctly, you should be taken through some online instructions. 9. Select “reboot” and enjoy.